The Exercise, Movement and Dance Partnership (EMDP) is the lead National Governing Body (NGB) for Exercise, Movement and Dance (EMD). It is a not-for-profit umbrella organisation dedicated to the development of Exercise, Movement and Dance provision throughout England and the UK. 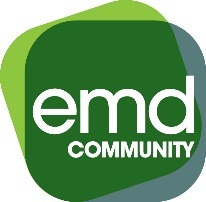 Through this the Exercise, Movement and Dance (EMD) Community is a network of quality teachers and organisations all passionate about one thing; inspiring others to be fit and healthy through exercise, movement and dance. Teachers from a wide collection of disciplines join the EMD community to obtain all the necessary checks, insurance and licensing, but also to get expert advice, resources and support to really help their classes thrive. Endorsements for your programmes and projects – to help you get that funding you deserve! The EMD Teacher Affiliation year runs from September to August. Their affiliation is calculated pro-rata and when you become a Popdance Teacher, you will be able to get all of the above benefits at a discounted rate.